We’re changing the CNG vehicle system acquisition process for the better. 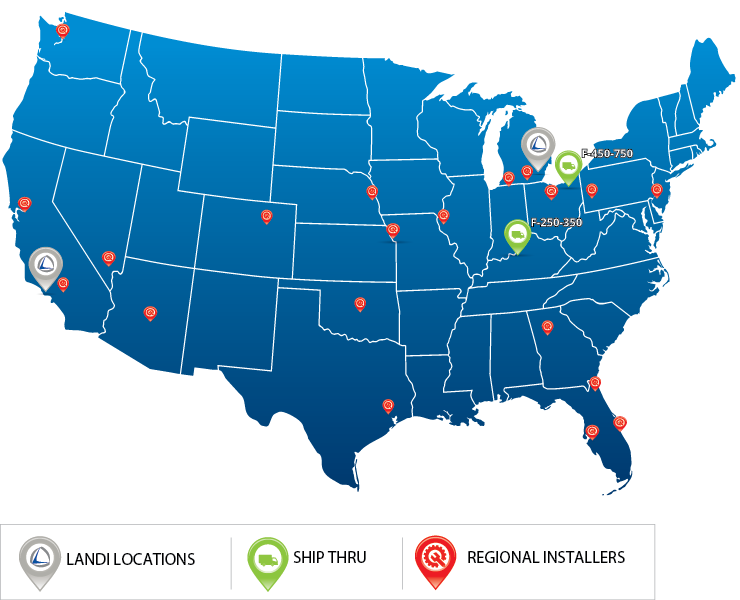 With our national footprint, you can choose the distribution channel that’s the right fit for your Ford fleet. With our Ford Ship-Thru codes, you can order your CNG system at the same time as your fleet vehicle and take delivery at your Ford dealership. The Landi Renzo CNG vehicle system is fully integrated at the OEM level and installed in one of our Ford-approved Ship-thru locations, strategically located near every Ford assembly plant. There are no hidden fees, dealer invoice charges, or extra transportation charges because your vehicles stay within the Ford distribution system from manufacturing to system installation and final delivery. Ordering is as simple as checking the option code on the vehicle order form. The base vehicle is then routed through the alternative fuel ship-thru channel and delivered anywhere in the country. In our world-class 25,000 sq. ft. installation facility located in Torrance, CA, we’re positioned to handle conversions for the Southern, Central and Northern California market, as well as the Southwest Region. Our nationwide authorized distributor network is comprised of Landi Renzo-authorized facilities with the unique ability to deliver standard and custom applications designed to meet your business needs. Because these distributors are local, they have the latest information on initiatives specifically designed for you, which can make the purchase and installation of an alternative fuel system even more manageable. As the global leader in clean fuel technologies, we have the expertise and industry knowledge to simplify the complex logistics of specifying and acquiring CNG vehicle systems. We have a better strategy which delivers a better solution.